In a country deeply divided, love for The Show is the chief unifying force, a work of genuine artistic merit bringing together people from every ideological walk and every side political, social, and religious spectrum. Most will never get to see The Show in person, as tickets are prohibitively expensive for all but elites, and it plays only in a few coastal venues. However, most people have heard the soundtrack and know at least a bit about its charismatic creator, Mr. Charisma, one of the few celebrities who seems genuinely nice and accessible. One day a promotion is offered. The prize: a chance to see The Show, not once, not twice, but three different times, as a guest of Mr. Charisma himself. The cost of entry: a mere $10 donation. For that price, you might as well buy 2, 5, 10 chances -- it's less than you'd spend on the cost of a single ticket, if one were ever available. The donation money goes to support the foundation of which Mr. Charisma's nice mother is a board member. This foundation stresses the social work it does on behalf of women, with special emphasis on women in poverty who have few chances. Its mission is to prevent suffering. What reasonable person could object? Some people don't like the foundation. Its core business, underneath the glossy exterior of women's health care, is a highly controversial Procedure -- the dismemberment of inconvenient children. Unwanted children, of course. Defective children. Children who might not survive anyway. There are people who hate what the foundation does, who work tirelessly in opposition to it, but some of them are weird and seem extreme, whereas the supporters of the foundation seem so nice and reasonable. People like Mr. Charisma and his nice mom. You've seen videos of them, and they seem so pleasant. How could people like that support something that's bad? And you want so badly to see The Show. This promotion buys you hope, the hope that despite the odds you might get to be a part of this beloved cultural phenomenon. Mr. Charisma is everywhere, on TV, in your social media feeds, pushing the promotion, touting the good The Foundation does. You feel a little conflicted about The Procedure, but lots of nice normal people like Mother Charisma support it. And what harm can donating $10 do? Many celebrities trade on their popular appeal to promote pet causes. The Gary Sinise Foundation provides support for wounded vets. Tom Hanks serves on the Board of Governors for the National Space Society. Angelina Jolie is affiliated with The Office of the United Nations High Commissioner for Refugees, and her foundation has made large donations to Doctors Without Borders. Each of these popular stars has used their celebrity platform to advocate for these causes which are not only directly reflected in the movie projects they've chosen, but are also extremely unlikely to needlessly alienate the portions of their base that don't share the actors' political convictions. Of course, aligning your brand explicitly with the nation's largest abortion provider is not unheard of. Lena Dunham, vocal PP advocate, recently said that she hadn't had an abortion, but she wished she'd had so she could reduce the stigma around the issue. Dunham, however, trades in pushing the envelope, and chooses her projects with that in mind. Miranda's most famous work is about Alexander Hamilton, born to an unwed mother, a man who had eight children, and who destroyed his political career and damaged his personal life with his reckless sexual behavior. There is nothing in the work itself that advances the agenda of Planned Parenthood. There is no link between the themes of Hamilton and abortion, except for Miranda trading on his personal appeal to push fans to the next step of thinking that PP is cool because a cool guy supports it. We needn't quibble over whether Miranda thinks his cause is righteous. It's clear that he believes that Planned Parenthood is a powerful force for good in the fight for women's health and empowerment. But the man is no cultural naïf. His father is a longtime Democratic politico in NYC. Someone raised in this atmosphere may firmly believe that abortion is a human right and a tool for good. But it's no secret, no matter how liberal your bubble, that half of Americans see the core business of PP as abhorrent. Miranda is well aware that his work has spanned a great cultural divide, on the other side of which are those people who consider abortion murder. His calculation here seems to be that the people who are alienated by this promotion are worth offending. And those people are taking notice. A frustrated friend said, "I am so angry about this ongoing promotion. The very idea that he would take the goodwill created by the most bipartisan and cross-cultural phenomenon in twenty years and squander it to shill for Planned Parenthood. It's just perverse." The lottery is called a "tax on stupidity", and yet statistically, nearly half of Americans bought a lottery ticket within the past year. These people are buying hope, the hope of the only chance they'll ever have of seeing the exalted sums of money promised by the Powerball jackpot. The cost of a ticket is negligible, especially considered next to the potential reward, and the money is supposed to be going to good causes like education. Do most people buying tickets think about where their two bucks will end up? Or it is a case of eyes on the prize, two bucks gets you a shot at $63 million? If you win, you've got $63 million. If you lose, you're out two bucks. The cause it supports is irrelevant, because the stakes are so low and the prize so desirable. This Prizeo promotion is more insidious than the state lottery. Hamilton is rightly celebrated as a modern artistic triumph. Darwin and I were fortunate enough to be able to afford tickets, and I don't regret that. Besides purchasing an enjoyable evening of theater for ourselves, the money we shelled out went to supporting the theater, the actors, the musicians, and the creative team that made Hamilton possible. It's more than possible that any of the people who received some share of our ticket price contributed to causes I find repulsive, just as it's possible that your Rogue One ticket money, parceled out among theater owners, theater employees, the movie studio, the actors, directors, producers, etc., went to causes that were personally significant to the individuals getting a cut. That doesn't imply your endorsement of anything but Rogue One. In this case the $10 donation, insignificant as it may seem for such an outsized potential reward, goes directly to Planned Parenthood. People who otherwise would never have considered donating to Planned Parenthood will figure that $10 doesn't matter because of the potential benefits of winning, and anyway, doesn't Planned Parenthood do other stuff besides abortions? Only $10, and Miranda will hand you that tempting prize apple off Planned Parenthood's tree. That's selling your soul cheap. MrsDarwin and I were both deeply frustrated to find constant spam showing up in our Facebook feeds: You like Lin-Manuel Miranda, here's his video about a contest where you can win a chance to watch all three Hamilton productions (NY, Chicago, and San Francisco) personally with Lin-Manuel just for donating to Planned Parenthood. It wasn't till we were discussing it in more detail today that we realized that we had somewhat different reasons for finding the situation so offensive. I think MrsDarwin lays out the general situation well above, and I don't disagree with any of her points. Several, however, did not occur to me because of my particular viewpoint, and other points, as I'll outline briefly, impressed themselves on me more strongly. I didn't recognize the temptation aspect, and this is because of the particular way that I react to drawings and lotteries of all kinds. Being someone who trade in probabilities, I gave very little thought to the idea that people who would not otherwise donate to Planned Parenthood -- as in, people who were actually ambivalent or somewhat opposed to it -- would be tempted to donate to get into the drawing. If anything, I often find myself reluctant to buy raffle tickets even for causes that I believe in because I consider buying a raffle ticket to be such a bad deal. (A bad deal how? Say you had the $500-$800 that it would take to buy a Hamilton ticket from a scalper. Would you stand a better chance of seeing Hamilton if you just bought the ticket or if you invested in 50-80 chances in LMM's Planned Parenthood raffle? I'd need to know the number of entires made, but you're probably at least several thousand times better off investing in a ticket than you are investing in his raffle. It's almost an offensively bad deal, less than cents of the dollar in terms of value.) Thus, when there's a raffle at our parish, an institution to which I give thousands of dollars a year, my very strong instinct is to refuse to buy even a one dollar ticket. Ask me to donate a hundred dollars and I'll do it, but ask me to buy a ten-dollar raffle ticket and I start making rational calculations. This isn't to say that I didn't think the fundraiser would net Planned Parenthood money. I figured that it was a promotion like the ones that I analyze at work. My thought was, if you're the sort of person who might be open to donating to Planned Parenthood anyway (and I've seen plenty of left-leaning friends announcing in their social media feeds lately that they're donating in order to stave off the repression they imagine is ahead), then this type of offer would likely get you to go ahead and make a donation. Many people have un-actualized intentions of making donations or purchases for long periods without acting on them, and once they've made a purchase it often makes them more likely (not less likely) to repeat the purchase later. So a promotion which activated a lot of tepid Planned Parenthood supporters would doubtless bring them money, but it didn't really occur to me that someone who didn't already like Planned Parenthood would be tempted to donate because of this offer, because it seemed obvious that your chances of actually scoring a Hamilton ticket as a result were near to zero. What did upset me a great deal, however, was the way that the ad was being thrust upon Hamilton fans of all descriptions, not based on any affinity for Planned Parenthood, but simply as a result of having liked one of the social media feed relating to the show. Not only was I constantly seeing the Planned Parenthood fundraising adds featuring Lin-Manuel, but I know that due to Facebook's marketing algorithms it was showing my friends these same adds with the unwilling recommendations "Your Friend [Darwin] Likes Lin-Manuel Miranda" or "Your Friend [Darwin] Follows Hamilton". This behavior seemed to violate the basic social principles for getting along in a divided world which have ruled -- perhaps as I think about the strength of my anger, ruled too much -- both my professional life (wholly) and my online life (partially). One of these basic principles is that before sounding off, one should take into account the feelings of the people likely to read one. Want to riff on gay marriage? As you decide whether to do so, or how to do so, think first about the people you know who are gay or feel strongly about gay issues. You don't have to lie to them about your feelings, but don't say anything about the topic you're not prepared for them to see. Want to talk about the cool new rifle you just bought? Consider that the nation was just convulsed that week with news of a mass shooting, and consider whether people who feel differently than you do about guns will see your post as threatening or upsetting. I'm sure there are still plenty of people who find my posting on various topics upsetting, but even in the online world I actually hedge away from talking about a lot of things, or modify the way that I talk about them, out of consideration for the way that my small readership would likely react to my comments. Indeed, at times I think that one of the reasons that the blog history in our sidebar shows fewer posts with each passing year is that as I get to now more people more deeply, there are fewer and fewer topics on which I feel comfortable sounding off quickly. And that's the online world, in which I give myself relatively free reign. At work, I obey a nearly absolute policy of never discussing politics or religion unless directly asked, and sometimes not even then. (I also make it a point not to be connected with anyone from work on Facebook.) Not that this means there's no friction. You don't get to have six kids (I haven't even told coworkers about the one on the way yet) without becoming a walking punchline. But there's only so much one can cover up in order to remain marginally acceptable in a hostile world. Why is it that we curtail what we talk about in certain settings and the ways we talk about hot topics when we do discuss them? We do so out of consideration for the feelings of others. We do so out of politeness. We do so because we don't want to hurt or offend people unnecessarily even when we disagree with them. Except that apparently Lin-Manuel Miranda does not believe that such strictures apply when it comes to fundraising for Planned Parenthood using the Hamilton brand. No, if you're on "the right side of history" you can take one of the country's most divisive topics and shove it into all your fans' social media feeds. You can even use their names to advertise your views to your fans' friends. I can't imagine that someone whose mother works for Planned Parenthood's political action arm is unaware that there are plenty of people in the country who don't like Planned Parenthood. It seems a stretch to imagine he thinks no one among his fans falls into that group. No, the clear message here seems to be: Who cares about any Hamilton fans who find Planned Parenthood offensive? I'll rub it in their faces and use their own fandom to promote my views to their friends without so much as a by your leave. If we show respect for the feelings of others by not shoving things which may offend them into their faces in neutral places (at the dinner table, at the office, etc.) then this shows the opposite of such: that those who disagree with Planned Parenthood are either so distasteful as not to be worth consideration, or so beneath regard that it never even occurred to Miranda to consider what those who might disagree with him might think. The fundraiser thus becomes not only a venue to raise money for evil, it's also a sign of raw power: He has the cultural power to ignore politeness and decorum and stamp the boot good and hard in the faces of those he disagrees with. Those of us who spend our lives keeping our heads down in order to hold a job and get along in a hostile society are reminded of the tenuous condition in which we live. Leia Organa: A Critical Obituary. The style is exquisitely on point. ...The Organa Doctrine identified the path to victory, but the woman herself remained on the front line, rarely pausing for conferences with Alliance intelligence droids. This may have contributed to the ambiguous reception she received in the post-Imperial era, as she didn’t emerge with the political influence accorded leaders like Mon Mothma . While they directed large scale operations (often per Organa’s theories and recommendations) she led covert operations on numerous worlds. She worked under deep cover as the bounty hunter Boussh, and during Galactic Concordance negotiations at the end of the war, admitted that during this period, she personally assassinated Hutt leader Jabba Desilijic Tiure. She was also revealed to be Darth Vader’s daughter, contributing to further marginalization not because of her ancestry per se, but in the context of an operation where she authorized Luke Skywalker (her collaborator in the killing of Jabba) to infiltrate DS-2, turn Vader into an Alliance asset, and kill the Emperor. Representatives raised questions about her objectivity, her use of political killing as a tool of warfare, the possibility that she might have granted Vader immunity from war crimes prosecution, and her indifference to risk, given that she was willing to sacrifice the last known Jedi in multiple operations. Organa was unrepentant. ...If Organa must bear some responsibility for her son’s defection, it might ultimately stem from the operation that sent Luke Skywalker to DS-2, where he allegedly attempted to recruit Darth Vader. By suggesting Vader might be redeemed not through formal justice but by reawakening a familial bond, she might have recast him as a romantic, tragic figure, and not the mass murderer attested to by countless sources. Indeed, she allowed Skywalker to give Vader an ad hoc Jedi funeral. Of course, this was Skywalker’s choice, and he subsequently trained Ben Solo, so the “last Jedi” may bear greater blame than either his mother or oft-absent father. I don't have a lot of truck with idolizing the great black-and-white moral lessons of the original Star Wars movies, so I appreciated Tom Harmon's disagreement with Steven Greydanus's fear that Rogue One is diluting the Star Wars brand. Up to a point, Greydanus and Overstreet are right. They have identified Star Wars’ beating heart. And it is true that Rogue One is a less ambitious movie than the others. It is true that self-surrender is the key to the victory of good in the Star Wars universe; but it is also true that the way was paved for those triumphant moments of self-surrender by a lot of rebels with blasters in hand—or in X-Wings—shooting down bad guys. Rogue One is their story, it’s a Star Wars story, and it’s a pretty good one. Rogue One’s descent into darkness and grittiness is really at the service of what Greydanus and Overstreet admire about the original trilogy. Rogue One allows us to glimpse the Rebellion without Skywalkers. The most unambiguously good characters in the original films are Luke and Leia; the other characters (insofar as they are real characters and not just supporting props, like Chewbacca or Admiral Ackbar) are mostly painted in shades of grey. Lando Calrissian and Han Solo are both drawn from their seedy, listless lives by contact with Luke and Leia, who inspire them to nobility, virtue, and dedication to a good cause greater than themselves. Rogue One contributes to the overall Star Wars story by showing a Rebellion strongly tempted to become a terrorist organization—a temptation that can be resisted because of the leadership and example of Leia and eventually Luke. Anne Kennedy on Private Grief in a Public Age. What I’m trying to say is, it’s fine if people are grieving and sorrowing about the deaths of a daughter and mother and maybe not so grieved about the deaths of people they have never heard of. The people who died in Chicago over the weekend are not publicly known in the same way, and so I can’t feel much for them, but that doesn’t mean that they aren’t mourned in their own sphere, that God doesn’t know, that their deaths don’t mean anything. Really, we have so cheapened private grief by making it public that now, if every terrible thing isn’t widely known, it’s as if if doesn’t matter or didn’t happen, which is just Not True. Death has become like Instagramming your dinner–only delicious with a Valencia filter. The origins of O Holy Night. Jennifer Fitz on why you should put aside your annual viewing of A Christmas Carol and actually read the book. We read it aloud the week before Christmas, ending up with the last stave on Christmas Day, as is right and fitting. Rob Alspaugh with some fine analysis on one of the less picture-booky episodes in Genesis: The Battle of Ten Kings. Last but not least, Mr. Christmas Day just turned three. Three is three. Two is the age where a boy (in this case) realizes all the things he might be doing, but he's not capable of doing. Three is the age where he thinks of the things, and he is now also capable of executing them, but is constantly being thwarted by older people because he has no judgment. For example, a boy might want to bring his tricycle upstairs, but his mother keeps stopping him when she catches him on the fourth stair up. Accordingly, the rage of three is greater than the rage of two, and the judgment of three is less than the judgment of four, and a parent is very weary. Fortunately, the conversation of three outstrips the conversation of two, and the logic improves a bit too. I took the man for a walk the other day, and had to constantly stop him from chewing on his coat collar. "Stop that!" I finally said. "You can't chew up your collar and get your coat all wet." "But I like to lick my collar," he said. I couldn't argue with that on the surface -- undeniably, he does like to lick his collar. "We don't lick collars," I said. "But I like to lick it." And just when I was at my wits' end pulling his coat out of his mouth in near-freezing weather, he found a big stick and proceeded to thump the sidewalk all the way home, collar licking forgotten. A couple weeks ago, spurred on by my wife's recommendation and by Brandon's fortnightly read I read A Civil Contract, a Georgette Heyer novel about a marriage of convenience which gradually develops into something deeper. It was a fun, fast read which I devoured in a couple of days, sitting up late reading while early pregnancy was sending MrsDarwin to bed early. One of the things that struck me in this regard was the contrast to much of my other reading. I don't read many books these days that are simply fun, fast reads. Much of my reading time is taken up with books which are at least tangentially novel research: books about World War One, about European history in the periods just before and after, and fiction either about the war or providing a window on the cultures which clashed in it. Right now, for instance, my audiobook is Buddenbrooks, Thomas Mann's novel covering several generations of a German merchantile family, and Verdun, a 1937 novel by French author Jules Romains about the battle of the same name. I'm enjoying both (Buddenbrooks is a better novel, but Verdun is quite well done) but neither is the sort of thing which I could read in bed for a couple hours at night without falling asleep, as I did with Civil Contract. It's not as if I find my other books boring. I want to read them and I'm finding them interesting. I suppose some dedicated readers can stay up late reading virtually anything that interests them, but (perhaps due to too many spells when I get only six hours of sleep or have some small person climbing in to thrash about the bed throughout the night) I find it hard to stay awake reading in bed for more than five to ten pages unless the book is both easy to read (as in fairly light) and fairly fast moving. Not necessarily in terms of suspense, but a certain type of prose construction which keeps the pages flipping easily. I'm not necessarily talking strictly of frothy books or "popcorn reads"; I've read some fairly dark and grim novels which certainly have the fast-read quality. I'm having trouble nailing down exactly what it is that puts a book in this category for me. Most of them are comparatively modern. Although there's a lot that has fascinated me out of the WW1-and-before era books that I've been reading, most hundred year old books translated into English don't seem to fall in this category for me. Because with non-fast reading it can take me a month or so to finish a book, I tend to fend off a lot of reading for fear of not getting to all the books I need to get to. And yet, a book that does have this fast-reading quality is finished within a couple days and thus doesn't actually put me back much in getting to my other reading priorities. Whatever it is, the refreshment that I felt after reading a quick page turner for the first time in three months or so was palpable, and it got me thinking that I should make sure to read more books which have that fun quality. It's not as if I'm in danger of falling away from reading, but it probably isn't good to be reading only denser reads. I am, after all, trying to write, and I don't want to fall into the habit of writing pages that don't turn easily. And also, activity creates habit. And I want to retain the pure enjoyment of moving through a book quickly to discover what happens next. One of the basic lessons of good writing is that readers are held by drama, and drama is created by conflict. There's something a bit pat about Tolstoy's, "All happy families are alike, but each unhappy family is unhappy in its own way," however it's true that happy or unhappy, is it the struggles and changes in life which are interesting to read about. Quiet bliss makes for good living but dull reading. This dynamic can make for some odd dynamics, however, when we think about conversion and relationship with God in terms of stories. Someone who has a tempestuous relationship with God makes for a more exciting story. You know the sort of thing: There were so many times he turned away from God. Hated God. Fell back into [insert spectacular sin here] and yet each time he returned with the fervor of a drowning man seizing upon a life raft. No matter how many times he turned away, at his heart he knew he needed God. These sorts of stories are dramatic to read, and in a story sense it seems as if someone who loves God despite so many obstacles, who turns to God so many times, must love God more than the more boring sort of believer. But such a relationship takes on a rather different flavor if we imagine it between two of us ordinary people. Take for instance: There are so many times he left his wife, cheated on her, beat her, stole from her, berated her. But deep in his heart he loved her so much that he always came back. Sound like a lovely marriage? Like a marriage full of deeper love than a quietly, undramatically loving one? No. We'd think of someone like that as a terrible husband. Of course, a key difference is that we can't damage God. To be sure, we can hurt Him. Every time we look at the crucifix we see the way in which our sins can pierce God. But God is infinitely greater than us, and so even while He is perfectly sensitive the to pain of our transgressions, He is also undamaged by them. When some other person hurts us too often and too badly, we're sometimes forced to turn ourselves away in self protection. It becomes difficult to rejoice in the latest contrition when we know it will be followed only too soon by another blow falling upon the bruise. God does not need to protect Himself in this way, and so God remains eager to welcome back the sinner at every repentance, however inevitable the next major transgression may seem. And yet, this does not mean that God is some sort of divine punching bag whom we can pummel simply because He can take it. The fact that we cannot truly damage God does not mean that we cannot hurt Him. A betrayal is no less an injury because it cannot be fatal. The fact we cannot truly injure God is important in thinking about repentance. In human relationships, it is sometimes true that someone is "better off if we leave them alone" at least for a time. This is never true with God. No matter how many times we have offended Him, He is always ready and eager for us to return to him. And yet, aside from the drama of spectacular falls and returns, presuming upon the fact that we can't injure God can become a way to excuse our own bad behavior. After all, breaking out attachment to sin often hurts, like breaking a badly healed bone so that it can re-heal straight. "God can take it," can become the mantra of inaction, the excuse to not break away from the sins to which we return so often. If changing will hurt us, and our offenses do not really hurt God, then why not string along a bit? After all, God is always ready to forgive one more time. But the implicit comparison of "will it hurt me more to change or God more to keep sinning?" misses what really occurs when we conform ourselves to God's will. Whatever the pain of breaking out old habits and attachments, to conform ourselves to God is to become our best selves, to attain to the highest good. Any pain that is involved in breaking free from out attachments to sin and conforming to God's will is the pain of the refining furnace. and the Pentateuch and historical books during Ordinary Time. In some Catholic versions of the Bible, 1 and 2 Maccabees are included before the book of Job, but the little Bible on my bedside table is the Revised Standard Edition which places those books in their chronological order at the very end of the Old Testament. It seems odd not to have the Old Testament end with the traditional last verses: "Behold, I will send you Elijah the prophet before the great and terrible day of the Lord comes. And he will turn the hearts of fathers to their children, and the hearts of children to their fathers, lest I come and smite the land with a curse" (Mal. 4: 5-6). Why would anyone tamper with such a clear segue into the New Testament? But the historical books of Maccabees offers another segue into the New Testament, in the struggle of the Jews against their Hellenistic overlords. Judas sends a delegation to make a treaty of friendship with Rome, rather in the way that one might approach the Godfather for his protection, and the Romans are pleased to grant their friendship, if not their immediate military support. "In those days a decree went out from Caesar Augustus that all the world should be enrolled. This was the first enrollment, when Quirinius was governor of Syria" (Lk. 2:1-2). "In the fifteenth year of the reign of Tiberius Caesar, Pontius Pilate being governor of Judea and Herod being tetrarch of Galilee, and his brother Philip tetrarch of the region of Ituraea and Trachonitis, and Lysanias tetrarch of Abilene, in the high priesthood of Annas and Caiaphas, the word of God came to John the son of Zechariah in the wilderness..." (Lk. 3:1-2). The Maccabees combined a zeal for the religion of their fathers with a zeal for regional power. An alliance with Rome seemed mutually beneficial and even noble. The description of the Romans in Maccabees (ca. 100 BC) makes them sound like the ideal men: ambitious for their country, but free and independent as citizens. Who wouldn't want to be allied with such a power? The kingdoms of the world crumble. The Hasmonean dynasty established by the Maccabees, rulers of an independent kingdom of Israel, devolves into a mess of infighting, and when Rome is appealed to, Pompey arrives in 63 AD. After some conflict, the kingdom of Israel is demoted to a client state of Rome, from which it never regains its independence. And the glorious ideal of Rome? 44 BC sees the assassination of Julius Caesar, kicking off a civil war that ended with Octavian assuming the title of Emperor in 31 BC. As Augustus Caesar, he put on a crown. He wore the purple as a mark of pride. The glorious Romans admired by the Maccabees eventually ordered a taxation census of their conquered territory under the governor Quirinius. (The date of the census was 6 AD, when Rome assumed direct control of Judea, although Luke places it about 10 years earlier, ca. 6 BC.) Opposition to this census resulted in the Zealot movement, responsible for many uprisings, and eventually to the destruction of the Jewish temple in 70 AD. In the midst of all this, a baby is born to a young Jewish girl, insignificant descendant of the once great Davidic dynasty, now only a memory. As Bishop Robert Barron points out, against the might and the armies of the emperor are arrayed the hosts of heaven who herald the baby. But they don't fight. Eventually that baby, now grown, stands bleeding and humiliated before the Roman governor and tells him, "My kingdom is not of this world; if my kingship were of this world, my servants would fight, that I might not be handed over to the Jews; but my kingship is not from this world" (Jn. 18:36). The kingdoms of the world are passing away. The power of Rome is chronologically more distant from us than David was from Mary. But the kingdom not of this world endures, and we celebrate its advent today. What Will They Do When They Grow Up? My latest piece of commuter reading is Thomas Mann's 1901 novel Buddenbrooks, which follows a German mercantile family through multiple generations in the 19th century. The Buddenbrook family are grain traders who (as of the novel's beginning) have reached the point of being a notable merchant family within their region. Much thought is given to the continuance of the family fortune and name. When young Antonie (Tony) Buddenbrook falls in love while on summer holiday with a university student studying to become a doctor (in that place and time a lower level of society than that of her family) her father writers her a letter in which he reminds her that they do not merely live for themselves. They are links in a chain. It's with this image in mind that Tony agrees to become engaged to the prosperous merchant her parents want her to marry rather than to her university student friend. Such dynastic concerns are alien to our modern, individualistic society, and yet family culture and background continue to have a large influence on how people do economically. I've found myself thinking about these things as own our children start to near college age. I myself sometimes feel myself an interloper of sorts in the business world that I have made my way into. I don't come from a clear set of family career traditions. Go back four generations and you have my dad's side of the family on small farms in the midwest and my mom's side working in silver mines in New Mexico. One of my grandfather's did a full career as a non-commissioned officer in the Navy, then worked in manufacturing. My other grandfather never went to college but during WW2 found his way into working in aerospace. My dad was a planetarium lecturer, living in the odd space between teacher, academic and entertainer. I studied Classics in college and through my teens had fostered various ambitions: writing, going into the Air Force, doing something in the film industry. What I actually did was get an office job through a temp agency, keep looking for the next step up, and end up spending the last ten years doing pricing analytics at gradually increasing levels of responsibility. The other night I was talking to the older kids and asked one of them what sort of career she might be interested in, and what she might want to study in college. Given what a driven kid she is, I was a bit surprised that the answer was so heavy on negatives: Don't want to be a teacher or a writer or do anything with math or science or history. Well. That rules out a lot of options. Of course, this is an off the cuff answer late at night after a long day, so it probably doesn't do to take it too seriously. I did find myself thinking about it an inordinate amount, however, wondering if there's more that I should to doing to convey the type of work which is necessary to maintain the family in the style to which its residents are accustomed. As it is, I don't tent to talk about work a great deal when at home. I spend enough hours dealing with work problems and personalities when I'm at the office, and I'm usually more eager to talk to MrsDarwin about things we have in common: books I'm reading, writing projects, the latest news or blog controversy. Regaling her with the doings of people she never sees, dealing with the cycle of setting financial goals and making plans to meet them, is not high on my conversational priority list. Yet I suppose in some sense that leaves work, and the earnings it provides, a mysterious process. I'm not really sure how the families which seem to produce generation after generation of lawyers, doctors, engineers and bankers pass those expectations on. Do they talk about the links in the chain, Buddenbrook-style? Or does it just get into the air after a few generations? Is Plausibility a Straight White Male? Apparently some people are worked up that although the main character in the new Star Wars movie is a woman, most of the other characters are men. I do not have an opinion one way or the other on this (and haven't yet seen the movie) but the links led me back into some posts on the balance between diversity and plausibility in writing fiction, which is a topic that I am interested in. The first piece is a rather long and rambling one by SF/F author Kameron Hurley dealing with the question of whether women historically were soldiers. (Her answer is pretty clearly given away by the title "We Have Always Fought".) She begins with an extended analogy in which she imagines a world in which all llamas portrayed in fiction are violent semi-reptiles, and people think that portraying a llama as a grazing mammal is unrealistic. She thinks something similar has been done with women, that women have always been clearly present in war settings but that they've been systematically excluded from fictional representations of war with the result that people thing war stories including women as fighters are unrealistic. I spent two years in South Africa and another decade once I returned to the states finding out about all the women who fought. Women fought in every revolutionary army, I found, and those armies were often composed of fighting forces that were 20-30% women. But when we say “revolutionary army” what do we think of? What image does it conjure? Does the force in your mind include three women and seven men? Six women and fourteen men? Women not only made bombs and guns in WWII – they picked up guns and drove tanks and flew airplanes. The civil war, the revolutionary war – point me to a war and I can point to an instance where a women picked up a hat and a gun and went off to join it. And yes, Shaka Zulu employed female fighters as well. But when we say “Shaka Zulu’s fighters” what image do we conjure in our minds? Do we think of these women? Or are they the ones we don’t see? The ones who, if we included them in our stories, people would say weren’t “realistic”? She in turn links to a piece by another SF/F author which deals with diversity in history more generally. Time and again, we see fans and creators alike defending the primacy of homogeneous – which is to say, overwhelmingly white, straight and male – stories on the grounds that anything else would be intrinsically unrealistic. But what happens when our perception of historical accuracy is entirely at odds with real historical accuracy? What happens when we mistake our own limited understanding of culture – or even our personal biases – for universal truths? What happens, in other words, when we’re jerked out of a story, not because the fantastic elements don’t make sense, but because the social/political elements strike us as being implausible on the grounds of unfamiliarity? Because as Roberts rightly points out, there’s a significant difference between history as written and history as happened, with a further dissonance between both those states and history as it’s popularly perceived. For instance: female pirates – and, indeed, female pirates of colour – are very much an historical reality. The formidable Ching Shih, a former prostitute, commanded more than 1800 ships and 80,000 pirates, took on the British empire and was successful enough to eventually retire. There were female Muslim pirates and female Irish pirates – female pirates, in fact, from any number of places, times and backgrounds. But because their existence isn’t routinely taught or acknowledged, we assume them to be impossible. And then there’s the twin, misguided beliefs that Europe was both wholly white and just as racially prejudiced as modern society from antiquity through to the Middle Ages – practically right up until the present day. 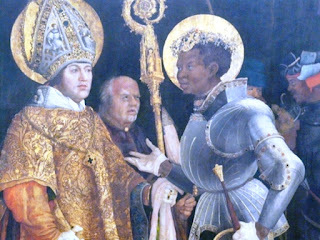 Never mind that no less than three Arthurian Knights of the Round Table – Sir Palamedes, Sir Safir and Sir Segwarides – are canonically stated to be Middle Eastern, or the fact that people of African descent have been present in Europe since classical times; and not just as slaves or soldiers, but as aristocrats. The network of trade routes known collectively as the Silk Road that linked Europe with parts Africa, the Middle East, India and Asia were established as early as 100 BC; later, black Africans had a visible, significant, complex presence in Europe during the Renaissance, while much classic Greek and Roman literature was only preserved thanks to the dedication of Arabic scholars during the Abbasid Caliphate, also known as the Islamic Golden Age, whose intellectuals were also responsible for many advances in medicine, science and mathematics subsequently appropriated and claimed as Western innovations. How we take this has a lot to do with what, as a fiction writer or reader, we're trying to do. That something is historically uncommon does not mean that it never happened, as the examples presented above underline. Say, for example, someone wrote a novel about a woman who fought in the Tsarist army during WW1, became a non-commissioned officer, and successfully petitioned the Tsar to let her raise an all-woman infantry unit. Would it be correct for a critic to say, "That novel is inaccurate because women didn't fight in the Tsarist army"? No. Because that did happen. However, if you were writing a novel set in the Russian army in WW1, would you be leaving out the contribution of women if you didn't include women soldiers? No, not really. The number of women who fought in the Tsarist army was pretty small, a few thousand out of a total mobilized army size of twelve million. A Russian soldier could have gone through the whole war without ever seeing a woman soldier. Hurley is not entirely wrong to say "The civil war, the revolutionary war – point me to a war and I can point to an instance where a women picked up a hat and a gun and went off to join it," but she's also only right within certain bounds. A few women successfully disguised themselves as men and fought in the Revolution and the Civil War, but in the modern armies of countries like the US and Britain the medical examinations and training regimes had developed to the point that a woman could no longer successfully pass for male and sign up as a soldier. When Dorothy Lawrence (a British reporter) wanted to go under cover as a soldier with the British army in WW1, she had to get serving male soldiers to smuggle her a spare uniform. Thus disguised she was able to move around the front line for ten days with the help of soldiers who knew she was really a woman, before she got sick and turned herself in to the military authorities. However, although there were women who served in designated female roles (transportation, medical, intelligence, etc.) under great hardship and danger, there were not women who successfully served in standard combat roles in the US or British army in WW1 or WW2. Other armies either officially allowed women to serve as combat soldiers (as did the Russian army in both world wars, though even in WW2 only 2-3% of Red Army personnel were women) or were loose enough in their training and recruiting that some women successfully served while disguised as men (this happened at least a couple times in the Serbian army, Polish Legion, and Austrian Army). I'm not sure where Hurley gets her "Women fought in every revolutionary army, I found, and those armies were often composed of fighting forces that were 20-30% women." statistic. It is true that in the 20th Century women were more often found as actual fighters in semi-irregular forces such as the various partisan/resistance organizations in WW2, the Irgun in British Palestine, etc. than they were in the regular armies of 20th Century nation states. This isn't necessarily because resistance and revolutionary movements were more progressive than organized armies, though in some cases it was. Communist movements mostly endorsed some form of women's equality. More key, however, even in societies we'd otherwise recognize as very traditional is the fact that revolutionary and resistance movements were always starved for recruits. They couldn't afford to be choosy in recruiting the way that a national army could. And in a guerrilla wars which often involved brutal reprisals against the civilian population, the rational that keeping women out of the army would keep them safe did not apply in may revolutionary and resistance movements. Revolutionary movements tended to be egalitarian in the same sense that a natural disaster is: they sprang from circumstances that affected everyone. However, as revolutionary armies formalized into armies, they often returned to the all-male norm. For example, while Polish revolutionary movements fighting against the Tsar included women, and women served in auxiliary roles in the Polish Legions and other semi-formalized military forces during the period of the Polish fight for independence in 1914-1921, the formal Polish Army which the fledgling state formed was all male. Similarly, in the early stages of the French Revolution, women at some points played key roles in the revolutionary mobs which fought against royal control. But in the formal armies of the French Republic and French Empire, women did not play any formal role in fighting. How, then, does all this relate to portraying history and women in particular in fiction? Fiction deals in particulars. You don't have to write a novel about the most likely kind of character. You could write a novel about a Chinese man who went to Roman Britain. It's a one in several million chance, but if it can plausibly happen you can write about it without being considered inaccurate. However, that it could happen doesn't mean that it was normal. Indeed, the very thing which is interesting about some of these situations is that it was so very unusual. The story of a women who dressed as a man and fought in the American Revolution would be interesting to read, but it was hardly a normal experience for a woman in the Revolutionary War. It would be inaccurate if you wrote a novel about the Revolutionary War in which woman-soldiers were all over the place. Similarly, it wouldn't be inaccurate to portray an Arab or Black character in Medieval Europe -- but if you wrote as if such characters were all over the place, you would not be writing in a way that was faithful to history. It's entirely legitimate both to write stories focused on unusual characters and to write stories about typical characters. This is one of the things I find frustrating about both activism and reaction centering around the portrayal of history in fiction. It's interesting to tell both the stories of people in unusual situations, such an African man traveling through Medieval Europe or a woman fighting in the Tsarist army, and to tell the stories of people in more typical situations. So long as they remain true to the history of their times, authors who take either of these paths should not be attacked for their choice of topics. The fact is, none of my children are particularly keen on Tolkien. Once upon a time writing such a sentence might have given me a good deal of pain, but the way that I think about books and their place in defining who we are had undergone some changes over the last twenty years. My parents both came from families not greatly into reading, but they both fell so deeply under the spell of Tolkien, Lewis and the like that they became lifelong influences. I would not exist without their interest in those books, since they met through a group for reading and discussing the works of the Inklings. I was an apple that did not fall far form the tree. I read The Hobbit at seven and the Narnia books repeatedly in my middle school years. I didn't read Lord of the Rings till the summer I was thirteen, but when I devoured it, reading the three volumes through in as many days, then turning directly to The Silmarillion, then reading Lord of the Rings through again. Fantasy and Science Fiction were nearly all that I read for fun in my high school years. These books were so important to me, and to most of those close to me, that by the time I went to college it was a basic assumption for me that the only really interesting people, the only people who were worth having in depth discussions with, were people who shared interest in these same books and these same genres. Because the works of Tolkien and Lewis seemed to speak so deeply to the way I understood the world, it also seemed natural to me that people who really read and understood these books would share my own views about life, the world, and its creator. Sure, with the advent of the internet I began to run into people who shared my passion for Middle Earth and Narnia but did not share my other beliefs, but at some level I was sure this must be because they hadn't yet really arrived at a full understanding of these books. Once they went 'further up and further in' in Lewis's words, they would arrive at the same place as I. If that sounds incredibly naive, it's because it was. It took me a while to realize that lack of interest in what had been my favorite books and genres did not necessarily make someone "a mundane", someone without interest in the deeper truths I saw in my favorite books. What's more, many who did like my favorite books liked them because they liked the spectacle and escapism of a magical or futuristic setting, not because they actually had interest in the what I most valued in these books. There's still a particular frisson to discovering someone else likes a book that you like. MrsDarwin and I in part became attached through my chance dropping of a Lewis Carol quote when we met at a freshman mixer. There's a real closeness to sharing a book you love with someone and having them love it too. That's in part why book lovers are so eager to provide reading recommendations. And there's still plenty of time for the kids to come around on some of my favorites. Sure, I loved Tolkien at 13-14, but many people come to it later. I don't think I'd do my favorite books any favors by pushing the aggressively on kids who aren't currently finding them interesting. But even if they never do come to love his books as I do, won't feel it as an apostasy that divides us in the way that I would have imagined I would twenty years ago. 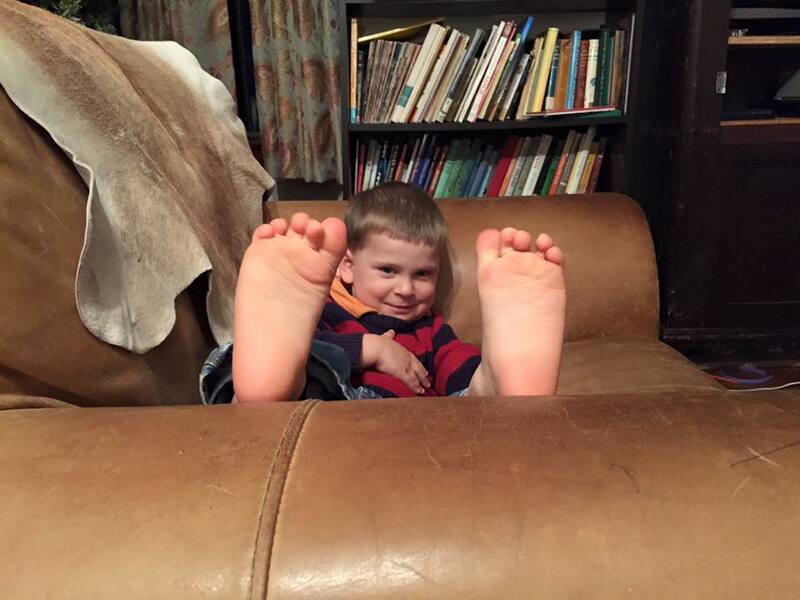 We got a kick out of this two-year-old's solution to the Trolley Problem. Well, we thought, we can play that game too! So we set up the train tracks with a Playmobil mermaid on the left track, and five assorted lego people and plastic soldiers on the right. Then we called William, our resident not-quite-three-year-old, and asked him what he should do. Without hesitation he grabbed the train, zoomed it down to the junction, jumped the tracks, and continued driving it straight across the floor. And that's about as seriously as we need to take the Trolley problem. My darlings, this can't possibly stay up for long, but for now: an entire recorded performance of Hamilton. Watch, my loves. Next week is the Advent retreat for our religious ed classes, so this week seemed like the right time to discuss confession with my 6th/7th graders. I know that most of these kids have gone to confession twice a year since 2nd grade because we have retreats twice a year in religious ed, but most of them can't tell why they should go to confession, or even what sin is. So, here are the notes I made prepping for the class, in basically the form I used for the kids. When did you first learn about Confession? Second grade? How old were you? Have you changed a lot since you were seven or eight? You're smarter now; you know a lot more about the world; you understand more things. Today we're going to talk about Confession, and guess what: you ain't in second grade anymore. It's time to use all that wisdom you've accumulated since second grade, and take a deeper look at Confession. But before you can confess your sins, you'd better know: what is sin? Doing something bad? Wrong things? Here's a definition: "an offense against reason, truth, and right conscience; it is a failure of genuine love for God and neighbor caused by a perverse attachment to certain goods" (CCC 1849). Or here's another: "an utterance, deed, or a desire contrary to the eternal law". Sin is setting yourself against God, choosing to elevate your own will over God's will. We can sin in our actions, in our words, in our thoughts, even in what we don't do, if we avoid doing what's good. Sin clouds our soul from fulling receiving God's love and grace, just like a dirty, salty windshield in winter makes it difficult for a driver to see what's going on around him. Jesus says in the beatitudes: "Blessed are the pure of heart, for they will see God." Confession heals our souls from the scars of sin. It wipes the glass clean so that the light of God's love can shine in us. God's love is always there, always shining on us, but if our souls are crusted with sin, that crust is a barrier against the light. We need the grace of confession to purify us and make us fully receptive to God. The church helps us with two categories of sin. God hates all sin, and it's all equally evil in his eyes, but these categories are ways to guide us in making our confession. The first kind is mortal sin. Who knows what mortal means? Yes, someone who's going to die. Mortal means deadly in this case. Mortal sin kills grace in our souls. These are big, serious sins, of the kinds that children don't often commit. Murder, adultery, lies that destroy other people, theft -- sins that have serious effects in the world and on our souls. These sins must be confessed before we receive the Eucharist. The other category is venial sins. These are smaller sins, temporally speaking, and they don't kill God's grace in us, although they wound our souls. But left unconfessed, they build up and lead us to develop bad moral habits -- vices. Unchecked venial sins lead to mortal sins. They dull our moral sense. If we love God, we want to rid ourselves even of small sins that pull us from him. This is a parable of Jesus's. You've heard it before -- The Prodigal Son. Let's read it and then go through it more carefully. The first step of a good confession is to Examine Your Conscience. It's not going to be very easy to confess your sins if you don't even know what your sins are. Where do we see the son first taking a good hard look at his life? Try even before he says he'll go back to his father. Verse 17: "Coming to his senses..." This is where he looks at what his life is like and how he's messed up, and decides to take responsibility. He examines his conscience. What's your conscience? (A couple of answers boiling down to a voice that tells you right from wrong.) Here are a few answers: "Man's most secret core" -- that's from the Catechism. (I didn't write down the reference, but the Catechism was quoting Gaudium et Spes 16.) Here's another definition: "the "judgment of reason by which the human person recognizes the moral quality of an act" (1796). Did you note the word "reason"? We don't judge right and wrong primarily by our feelings. Feelings can be strong, but they're not always a sure guide. Have you ever seen someone carried away by their feelings, overreacting, or someone who feels like they're always right and everyone else is always wrong? (lots of agreement.) God gives us our reason to distinguish what's right from what's wrong. Sometimes your feelings are also a good guide for you, but other times they aren't, and we need to train our reason and our conscience so that we're able to see past our feelings to what's true. Step two: A sincere sorrow for sins. Is the son sorry for what he's done? Let's talk about the two kinds of contrition, which is another way of saying "sorrow for sins". "Perfect contrition" is the best kind: when you're sorry for your sins for the love of God, because your sin is an offense against his commands and because it's a poor response to his overwhelming love for you. Is this the kind of contrition the son has? Hm. Well there's another kind of contrition, appropriately named: "Imperfect contrition". Anyone ever been sorry for doing something wrong because you knew you were going to get in trouble? Have you ever been sorry for something because you see the lousy consequences of your action? Let's look at the son's contrition. He's sorry because he's broke and living in a pigsty, and he's starving, and because if he'd stayed at home he'd have a better life, and because even his father's servants are doing better than he is. And you know what? God accepts our imperfect contrition in Confession! Even imperfect contrition is good if it moves us toward God, as it moved the son toward his father. The grace of Confession covers even our poor contrition and makes it acceptable to God. Step three: Confess your sins. We're both body and soul. All the reasoning we do with our conscience, and the feeling sorry (or the intellectual knowledge that we should be sorry) isn't going to do much if we don't take physical action. The son does that. First, he actually gets up and goes to his father. How does the father respond? He's looking for the son. He runs out to meet him partway. All this before he's even said a word! Then the son makes his confession: "I have sinned against God and against you." What do you think would have happened if the son hadn't said he was sorry? What if he'd just sauntered back and said, "Hey guys, I'm home!" and wore the rings and fine garments and eaten the fatted calf? Would the father have had a hard time believing that the son was sorry? What about the people around him? What if you lied to your mom and never apologized? Would that trust between you be damaged? Confession -- in words -- was crucial to rebuilding the bonds of trust in the community. Our sin doesn't just hurt us. It always has repercussions for others, even when we think it's so secret no one will know. Hidden actions come out. Even sin in your thoughts affects how you treat other people. In Confession, we not only rebuild our relationship with God, but with his Church. Step four: Resolve to amend your life. Do you know what "amend" means? If you mend a hole in your clothes, you fix the hole. If you amend something, you fix it and make it better. To amend your life means to turn away from your sins. Does the son have a firm purpose of amendment? I think he does: look how he's planning to tell his father that he deserves to be treated like a servant. He's ready to accept that work, maybe even to contribute to repairing his father's fortune. He knows that he has to change the way he's been living, in ways that don't include behavior that squanders fortunes or leaves him feeding pigs. Maybe he knows that his dad is going to throw a feast for him, and he figures that it won't matter if he makes the offer. But he has to make it, and he has to take the chance of it being accepted. God hates sin. He hates it so much that he came to suffer and die to defeat sin and to take the consequences for us. We resolve to amend our life, to move away from our sinful behavior, because we realize the consequences of continuing to sin. Step five: Do the penance assigned. Here's a question: does the son do penance? We don't know: the parable stops before we see that. We do know that the father doesn't assign the son the penance the son suggests: treating him like a servant. In confession Father may assign you three Hail Marys, or to pray for someone who you've hurt, or who's hurt you. Are three Hail Marys equal to Jesus's sacrifice on the cross? No, nothing is, or ever can be. We can't make up by our actions for our sins, but penance, accepted in obedience, can help us train our wills to God. When you receive your penance in confession, do it immediately! Kneel down as soon as you come out of confession and pray! Penance is a way of giving God our love and gratitude for his forgiveness, and of showing a firm purpose of amending our life. Well, look at the steps of confession. A priest can never reveal what's told him in confession, so he can't report the murder. But if the murderer is truly sorry, if he truly wants to amend his life, he'll obey if the priest tells him to turn himself in. And if he's not truly sorry, he can't be absolved. Contrition is a necessary part of confession, not just an afterthought. Penance is a necessary part of confession, not just an afterthought. God calls us to cooperate in his forgiveness. He doesn't force it on us, and he's given the priest the power to withhold absolution in some situations (John 20:23, Matthew 16:19). So we've talked about the five steps of a good confession. Now let's talk about actually going to confession. And why should we go to confession? We know that only God can forgive sins. We know that he hears our prayers when we ask him for forgiveness. But he has chosen to directly forgive sins through the sacrament of Confession. He gives us a liturgy through which we can know we are forgiven and repair the damage our sin does to us and to the rest of his body, the Church. Don't ignore that. The sacraments are crucial to our life in Christ because they are direct conduits of his grace. Take advantage of that grace! Do you remember what you did last time you went to confession? Are you nervous because you think you're going to get it wrong? Don't be? Remember that actors rehearse and rehearse so that they know exactly what they'll do on stage. God gives us rituals so that we know what's coming, and can focus on being prepared. Examine your conscience! I've got an examination of conscience appropriate for your age group which we'll go through, but there are lots of ways to examine your conscience: the Ten Commandments, the Beatitudes, other guides. Use them! After your examination of conscience, you're ready to go to confession. You can sit facing the priest, or you can do what I like to do, and go behind the screen where the priest can't see you. Either way is fine, so don't feel like you're obliged to do one or the other. How should you start? Well, it's good to have some words to get started. One of the best ways is to use the words people have used for years: "Bless me, Father, for I have sinned." That's easy to remember, and it's to the point. Then tell how long it's been since your last confession. If you say it's been one week, Father will know that you're pretty experienced. If you say ten years, he'll know that you might need some help remembering what to do. It gives him a guideline for helping you. Then you confess your sins. Remember, you're not talking just to Fr. Watson. Father won't even remember what you say to him, and thank goodness for that! You're speaking to Christ exercising his power through Father. Be honest. You don't hide sickness from the doctor if you want to be healed, and you don't hide sin from God if you want to be forgiven. Now listen to Father. He may give you some good advice for how to lead a better life, or if he's pressed for time he may just assign you your penance. Remember what it is, so you can do it right away. He'll ask you to say an act of contrition. Does anyone have one memorized? (One hand goes up.) This is a great prayer to memorize, to say at nights, when you're thinking about your day. You memorize it so you don't feel nervous about what words to use. There are many versions of the act of contrition. I've given you the one I learned when I was young, but there are other forms. But you'll notice that this act of Contrition contains all the steps of making a good confession: sorrow, confession, purpose of amendment and penance. It's a microcosm of Confession itself. The Church loves these cycles. The Mass on Sunday is a microcosm of the week, in which we remember Jesus's death on Friday and his resurrection on Sunday, and that's a mirror of the liturgical year, which is a mirror of history itself. Now Father speaks the words of absolution: "Through the ministry of the Church may God grant you pardon and peace, and I absolve you from your sins in the name of the Father, and of the Son, and of the Holy Spirit. "Make the sign of the cross, and thank Father! Then go out and do your penance right away. Don't walk out of church without doing what Father asked, unless he asks something that needs to be done later, like reading a Bible passage or talking to someone. And there you have it, and I think after a day of moral theology we can end a little early. Let's say the act of contrition as a closing prayer. "The veteran with venison valeting him"
This is the best thing I've seen this week, and that's saying something in a week I saw the Guardians of the Galaxy Vol. 2 trailer. I'm currently reading Ian Kershaw's To Hell And Back: Europe 1914-1949. We talk about the importance of guarding democracy, and it is important, but the first and most basic element of that is wanting democracy in the first place. Wait, where have I used that formula about "just surfacing" before? Hm, don't know, could it be one of the five times I've been pregnant while writing this blog? Not all the times I've been pregnant, you understand; only five. There are women out there begging, pleading with God to let them have a baby, just once, and I'm throwing up through my nose for the seventh time. I asked God about this, but he replied in a small still voice I couldn't hear over my own gagging. So: we don't always get what we want, but we get what we need. Physically, I didn't want or need to be pregnant; already my body is sustaining wear and tear that's going to take further years, if ever, to undo. Mentally? not what I was planning for, to be sure. So it's spiritually that I needed to be pregnant, except you can't just be spiritually pregnant. There has to be a physical component, the component of actually growing the baby in your body. Baby is growing, thriving probably, taking the nutrients he or she needs from me, and I give, will I or no: my time, my energy, my health. Mine, mine, mine, only not mine anymore. Cottage Cheese: curdy, acidic. Not recommended. Chicken Stir-Fry: chew well, lest you see chunks. Popcorn: the worst, especially in your nose. Waffles: a winner! Nice and soft, non-irritating. I'm going to go to the doctor, eventually. I don't see the rush to go in and hear that I'm pregnant and Advanced Maternal Age, and would I like some extra tests? I haven't even decided whether I want to go with the midwife or with a doctor. There's no hurry. To be honest, I'm leaning toward a doctor and a hospital. I've had six unmedicated births, but I'd kind of like to be put completely under this time, maybe for the next seven months, and just have a baby handed to me at the end. Let me be clear: I love babies. I love this baby, all 0.7 ounces of it. (A eight-week baby is the size of a peanut M&M, did you know?) But I hate hate being pregnant, and after six times I don't feel like a pro. I feel worn down with being constantly nauseous and tired, and with having a softening, thickening, atrophying body -- and that's not even taking into account the coming day of torture. I'm not even thinking that far ahead. Yeah, I said all on the blog the last time around, and probably the three times before that, too. The world may be changing, but some things remain constant. Apparently it's Small Business Saturday, so what better way to support independent musicians than by selecting the winners of our sister|sinjin giveaway! The lucky pair are Rosebud and Spiritual Diabetes! Send us an email at darwincatholic@gmail.com with your name and address, and we'll get that off to you. I must have read it a dozen times on social media and opinion pieces since the election, so I imagine you've seen it too: people saying, "America today is where Germany was in when Hitler was elected." Historical analogy is a powerful tool, and seeing echoes of the present in the past is one of the illuminating things about studying history. However, it's at least as important to understand the differences between the past and the present as it is to see the similarities, and I think that in this case the differences are so great as to make analogies invalid. Let's start with the bare bones of the story: In 1932 Germany was in the grips of the Great Depression. 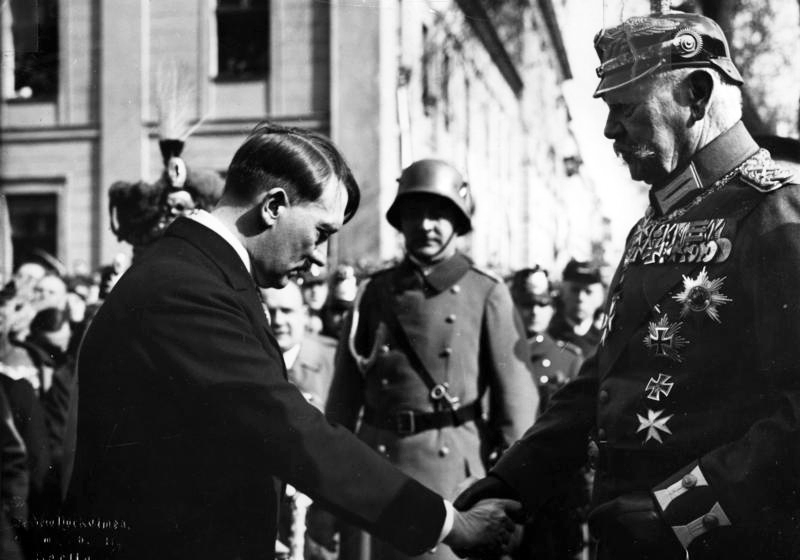 Hitler ran for the position of President against the incumbent, WW1 hero General Paul von Hindenburg. Hitler came in second with 35% of the vote. 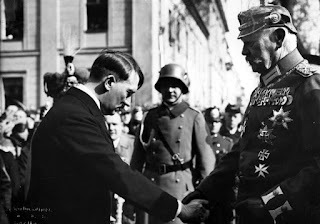 However, in the parliamentary elections that year, no single party won a majority of seats, and so Hitler's NSDAP (Nazi) party which had the largest number of seats formed a coalition government with another party, and Hindenburg was persuaded to appoint Hitler as Chancellor. (Hindenburg himself did not belong to a political party and had run on his war record.) The next year, in 1933, the Reichstag Fire gave Hitler a pretext to crack down on his political opponents and seize dictatorial power. There are certain similarities which people have made much of: Leader known for holding big rallies drawing on dissatisfaction with the economy and accused of scapegoating ethnic minorities comes in second in the popular vote but gains power anyway. One particularly inventive approach to hysteria pointed to contemporary reports of less anti-Semitic violence occurring than was feared when the Nazis first seized power, and thus drew the argument-from-silence type conclusion that if the Trump administration doesn't appear to be violently repressing minorities, that's when we really need to worry he's bad! I'm not here to argue that Trump is going to be a good president (I think he'll likely be a lousy one) nor that his campaign hasn't been a center for anti-immigrant and at times racist behavior. There were very good reasons to oppose Trump. However, there have been a lot of bad world leaders who were not Hitler, and what is not appreciated nearly enough when people talk about how Hitler's rise "could happen here" is how much the rise of Nazi Germany was a product of its own very specific place and time. The first and most important thing to understand about the German Republic of which Hitler became Chancellor in January 1933 is that it was a very new and unstable republic. The German Empire, its ancestor state, had existed only for 47 years from 1871 to 1918. The Empire fell as Germany struggled to avoid a catastrophic loss at the end of World War One, a war in which the country suffered nearly two million soldiers killed and four million wounded. Many civilians suffered malnutrition as a result of the Allied naval blockade which slowly strangled Germany's food supplies during the four years of the war, and the Spanish Flu pandemic then killed nearly half a million -- many of them children and the elderly. When the Western Front collapsed, sending the German Army, which had occupied Belgium and northern France throughout the war, reeling back towards its homeland, and the Imperial Navy which had been bottled up in port since the Battle of Jutland mutinied, the German leadership sought an armistice to end the war before their country was invaded. The imperial government (which the allies had hinted should go in order to make peace) collapsed, Emperor Wilhelm II went into exile, and a parliamentary republic was put together under the leadership of SPD (Social Democratic Party) leader Friedrich Ebert. Formed as the country collapsed, the German Republic (or Weimar Republic, named after the city of Weimar) was conceived in political violence that it never succeeded in escaping during its life of just fifteen years. Prior to the war, the social democrats were the largest single party in Germany's parliament. However, as the empire fell, the radical left elements of the social democrats split off and tried to stage a communist revolution on the model of the Russian Revolution. The government, led by the non-revolutionary half of the SPD, was forced to rely on the unofficial, paramilitary Freikorps organizations of nationalist former soldiers to put down this communist revolution. Remember, Germany had not gone through an orderly de-mobilization such as happened in Allied countries. The government had collapsed while millions of soldiers were still serving on both the Western and Eastern fronts. In the East (where Soviet Russia had sought a separate peace with Germany) the German army had been governing much of Poland and Ukraine for the last year or more. Many soldiers made their way home still armed, providing a huge number of potential fighters available to both sides of the brewing revolution if they could be persuaded to join. Meanwhile, the peace imposed by the Allies, designed to keep Germany from being able to start another European war, left the government with a very weak army and police force with which to try to contain the explosive situation. The Freikorps successfully put down a series of socialist/communists revolts during late 1918 and 1919, in the process killing (without trial and largely without consequences) the leaders of the radical socialists. However, having used paramilitary violence to put down the revolutionaries who had genuinely threatened the fledgling state, the leaders of the Republic had little ability to put the genie of political violence back in its bottle. 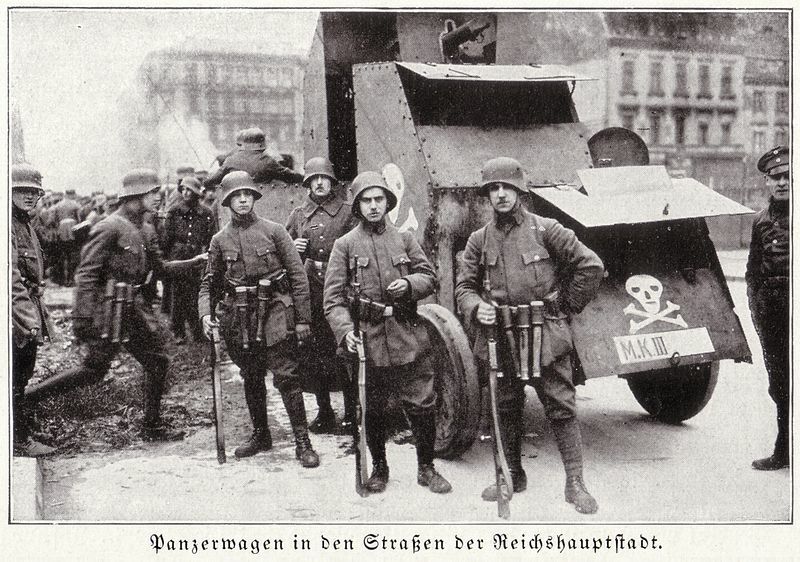 The Freikorps predated the state, and it was not possible to repress them and other similar unofficial military organizations. Unlike our two party system, the German Republic has many political parties vying for seats in the legislature. Some parties did not acknowledge the government as legitimate, and both nationalist and communist parties had paramilitary wings which engaged in street fighting and intimidation. These were revolutionary parties, and the purpose of their paramilitary wings was to engage in revolutionary violence. Hitler and the then-tiny Nazi party attempted to stage a coup, the Beer Hall Putsch, in 1923 but they failed and Hitler ended up serving time in prison, where he wrote Mein Kampf. On release, Hitler pledged to abide by the democratic process rather than seizing power illegally (a necessary condition for the Nazis being allowed to participate in politics and for Hitler to be allowed to make speeches in public.) However, the Nazi party still maintained a paramilitary arm, the SA. Even so, however, Hitler didn't have a majority of parliament. He at last attained dictatorial powers by first having all the deputies representing the Communist Party arrested, then sending his paramilitary SA forces into the building where the parliament was meeting and, virtually at gunpoint, getting a vote for the Enabling Act, which gave him the ability to pass laws without the consent of the Reichstag for four years even if those laws violated the constitution. Needless to say, with Hitler now in absolute control, that power was never allowed to expire. Within the first few months other parties were outlawed and their leaders imprisoned or executed. Hitler then purged his own party leadership to centralize control, turned his party's paramilitary organization into an official state organization separate from the existing police and military, and consolidated absolute control. Hindenburg died in August, 1934 and the office of President was allowed to die with him. The German Republic no longer existed. - The country itself was new and unstable. - The country originated in catastrophic military defeat and its origins had normalized the use of large scale political violence (as in, barricades, machine guns and artillery in the streets -- not burning a few cars during a protest). - Several significant political parties, both nationalist and communist, rejected the very existence of the state and endorsed revolutionary violence. This was perhaps one of the biggest factors in "normalizing" Hitler and his party in the German Republic: since multiple parties endorsed violence over abiding by free elections, many people felt they needed to side with one anti-democratic party in order to counter the other anti-democratic parties. - A parliamentary system with many political parties led to frequent elections held in times of national emergency as no one party or coalition could hold a stable government together. - Hitler's political party included a significant paramilitary wing which could be used to murder rivals and conduct street warfare against other parties. - Having seized partial control of the government, Hitler used the state to outlaw a major rival party and jail a significant number of members of the parliament in order to tilt a vote in his favor. - He then brought his own party's armed, paramilitary wing into the legislative session in order to force his will through at the point of a gun. As I would hope this list makes clear, although we've just been through a divisive election and our president elect is someone whose wisdom and good will we have good reason to question, the situation in our country is pretty much nothing like that in Germany at the time of Hitler's rise to power. People need to stop saying that it is. They're needlessly scaring themselves and others, and they're also further corroding our already divisive politics by claiming that our situation is "just like" the rise of Nazi Germany. Do we need to be vigilant and guard our freedoms? Yes, now more than ever. But please, understand the real historical circumstances which allowed someone like Hitler and a party like the Nazis to take total control of a state. Understand it, learn from it, and do not make panicky false analogies. Elizabeth Duffy, a longtime Friend of Darwins, has teamed up with some talented ladies to form sister|sinjin, and they've just recorded their first album. The two sample tracks are lovely enough that I've ordered it, and I'd like to to share it with you as well for your Advent meditations. So, you know the drill. Leave a comment to enter, and on Saturday (or Sunday, depending on how I feel), I'll pull two names out of the hat to win the limited edition CD in a hand-stamped sleeve. Happy listening, and good luck!